Get ready to be spoiled by the lovable Grandma Giddywinks and some delightful Puzzle-solving fun! It`s quilting time! 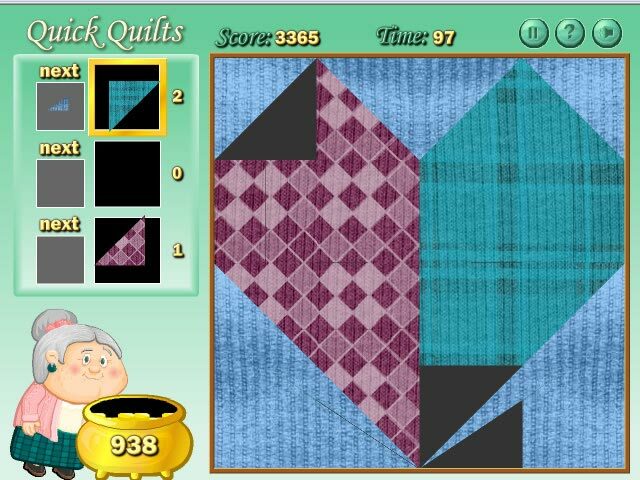 Every quilt has a distinct pattern, and it is your objective to try and impress Grandma Giddywinks by uncovering the pattern and completing your quilt block before time runs out! With many patterns to complete and plenty of quilt fabrics to choose from, the varieties of quilt puzzles are endless. Quilting Time is rated 3.5 out of 5 by 12. Rated 5 out of 5 by zia1954 from It is my favorite game of all time I am a frustrated Quilter, I just do not have time to quilt, but I love to try out different colors with the patterns. It never bores me, it is challenging as well. I like the way you can tickle the Grandma and make her laugh. 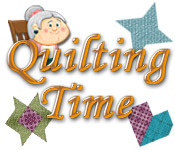 I too would buy Quilting time 2 in a minute!!! Rated 5 out of 5 by JoyLynn1 from Just My Opinon. I had a hard time getting the game to download but once I did it was a lot of fun. Rated 5 out of 5 by timbermoon from I really enjoyed this! This game is just plain fun. It is an enjoyable puzzle game, but is also satisfying in an aesthetic way. Choosing the fabrics to be used makes putting together the finished products even more appealing. Of course, I am a quilter, so I may be a bit biased. :D I would love to see a sequel to this charming game. Rated 5 out of 5 by jil1 from Great PG I love this game. I play and play and play... and can´t stop playing. 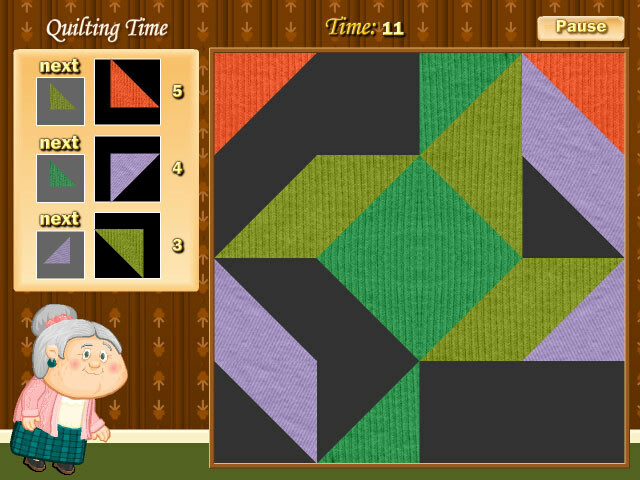 I suggest you to create a Quilting Time II with new shapes. I´ll buy too, with no doubts. It´s really a delightful puzzle game. I recommend it. Rated 4 out of 5 by Babs421 from women I love this game being a woman of a mature age is probably why I love this game. Its a game I would share with my grandma and aunts, possibly my young grand daughters. This may help me pass on a dieing art to the younger generation. Rated 3 out of 5 by bemmychance from Nice way to unwind at the end of a long day I like this game because it's relaxing, but do all the "fabrics" have to be so mismatched....and ugly? They make you pick 4 or 5 fabrics....but only 3 of them look good together at one time! Rated 2 out of 5 by TapsFan from Played 15 minutes of the trial and deleted I like a challenge, but this was ridiculous. The voice over is annoying and the graphics are amateur time. Rated 1 out of 5 by Dorothy81 from Really? World Class stupid game. Thankfully I only wasted five minutes of my life to find this out. The "grandma" is just plain annoying and the game is BORING! No thanks. 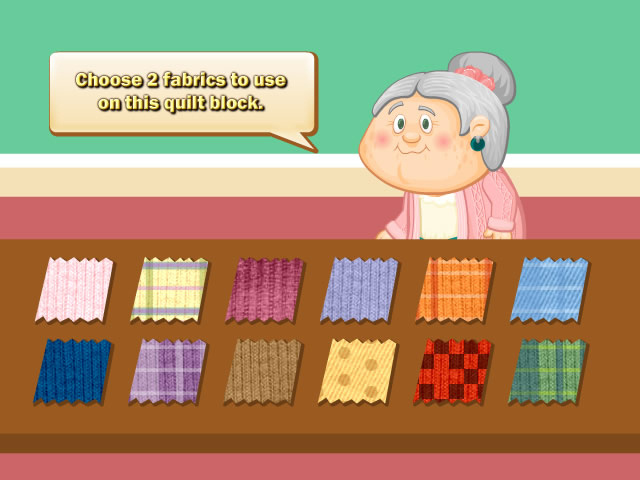 Get ready to be spoiled by the lovable Grandma Giddywinks and some delightful puzzle-solving fun! It`s quilting time!